Offer two types of treats to your backyard birds with this Stokes Large Hopper Feeder with Suet Cages. The rectangular shape, steel frame, and brown hues add a traditional look to your bird garden, while remaining usable for many seasons. Two clear, plastic panels complete the center reservoir, which easily holds 5.6 quarts of sunflower, safflower, or mixed seed. An integrated seed diverter at the base of the unit directs the food toward the bottom gaps, enabling several birds to dine. For added avian activity, place a standard suet cake in each of the two suet cages, affixed to the two ends of the unit. 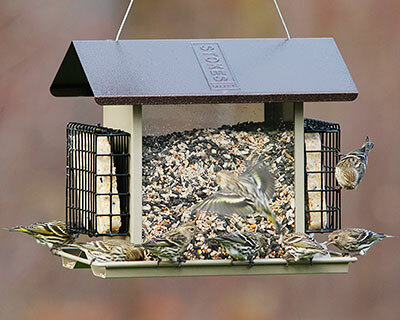 The 1" x 0.5" rectangular grid offers birds ready access to the suet, and the cages both open at the top to clean or refill them. A generous, copper colored roof completes the piece, keeping the food dry and fresh. A plastic coated cable through the lid makes it simple to hang the feeder, and allows you to lift it in moments for refilling. For a different look, pole mount the piece on a 1" outer diameter pole using its integrated mounting socket. The metal and plastic construction forms a durable item, and the brown hues throughout mesh with your landscaping. Keep several bird species fed by adding this Large Hopper Feeder with Suet Cages to your yard.